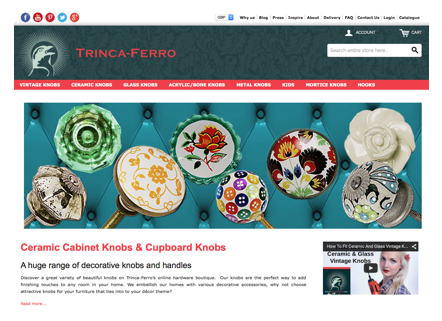 After running a successful furniture business in Brazil for 10 years, Robert Lancaster came back to London and founded Trinca-Ferro to specialise in selling their best-selling drawer knobs. The Trinca-Ferro is a Brazilian songbird with a loud and shrill singing voice. Using a purely online route to market, Trinca-Ferro’s knobs are exported directly from India to anywhere in the world. From the outset, Robert knew Trinca-Ferro’s market would be global and he enlisted the help of a specialist Export Business Mentor to provide support and advice. “I wanted to find the best way to sell my knobs globally through my website”. Create country-specific directories for target markets: Sarah advised adding a subdirectory targeted to Australia with prices in Australian dollars with relevant language and country targeting. Her report also showed how to do this in Trinca-Ferro’s other target markets including the USA and Germany. Remove the Google Translate facility and use a professional translator for relevant languages: Google translate is not ideal to promote a company’s messages in another language in a professional way. It is critical for a new brand to communicate correctly in the local language. Create a content engagement plan: to help ensure Trinca-Ferro’s blogs, press, newsletters and social media were integrated and focused on developing the business.